Learn Why Becoming A Critical Bench Affiliate Is Literally One Of the Quickest And Easiest Ways To Make Money Online… Guaranteed! Not only will you earn extra money with very little work on your part… (Because we give you ALL the pre-made tools you need to succeed) but you'll also help people improve their health, body, and lives! Do you have a fitness-related website, email list, blog, or newsletter? Are you always looking for high-quality fitness products to promote? Would your subscribers be interested in getting high-quality information that helps them gain muscle, lose fat, and get in the best shape of their lives? Would you like to partner with a top-notch company with a proven track record and reputation for providing value? Would you like to make commission checks of anywhere between to $500 to $1000 each and every month... simply by sending people to my site? Are you an ethical, experienced, and reputable online marketer who would like to earn some extra cash promoting high-converting products with an incredibly low refund rate? Are you looking for the fastest and easiest way to start making sales online with a company that stands head and shoulders above the rest when it comes to their affiliate support? If you answered yes to ANY or all of the above, you can easily promote the Critical Bench products and start earning money instantly as an affiliate. The best part is… you don't have to do a thing except send people to our high-converting, professionally-written website. Once the sale is made, you get paid a commission and we take over and do the rest. We'll handle the fulfillment and customer service so you can be hands off. Not only that, but since we've been online for 10 years now, we've become known as a high-quality, extremely helpful and well-respected destination site. People all over the globe are earning a significant income by being Critical Bench affiliates… and they're doing it without the hassle of developing a product, taking care of shipping or dealing with customer service. Here's your chance to start promoting one of the hottest and highest-quality product lines online. We've been online for over 10 years now… so you can be sure we wouldn't have survived that long if our products were junk. You can feel good about referring traffic to us because not only does it have a better chance of converting to a sale, you can be sure your visitors will get a high quality product and experience! The Critical Bench products sell like hotcakes because we've built up a rapid following and fan base because of the quality of our content. You want to feel good about sending people to a site that's going to take care of them, right? Your customers will appreciate it when you send them our way because you'll be helping them get in shape and improve their lives. And hey, why not make yourself some good money while you're at it! We're also one of the highest-paying affiliate programs in the fitness niche, giving you 75% of each sale. Many fitness companies only give their affiliates 6 to 25% commissions on their products. It takes a TON of sales to make money this way. But we believe in treating our affiliates like family. That's why you get 75% of each sale. Our product price range goes from $9.99 to $197 so if you want to promote the higher priced products… you can make more money. Our refund rate is one of the lowest in the fitness industry! You get 24 hour access to real-time stats! Since Clickbank processes credit card orders and also tracks our affiliate sales, you can log in any time to stay up to date with your earnings. 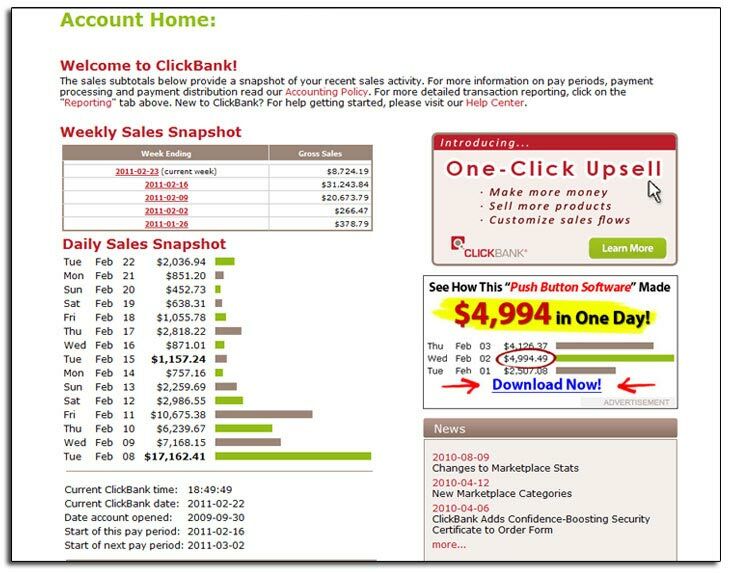 Clickbank also uses a 'cookie' system that track your visitors for 60 days after they visit our site. If you send me a visitor who doesn't buy right away… but comes back any time within the 60 day period… you still get the commission! We also have one-click up sells In Place! Critical Bench is a preferred Clickbank merchant… so they gave us some special features that give us an unfair advantage over other affiliate programs. We have 1-Click upsells in place, which allows additional products to be sold to a customer during the purchase. This way, you can earn extra commissions on any upsell purchases! This 1-Click Upsell feature is only provided to qualified vendors who have met extensive Clickbank standards and requirements. Less than 1% of Clickbank products have access to this software and this alone will help you make more in commissions with us. We also have custom order forms, $1 trials and a lot of other special features not available to 99% of the vendors. Best of all, when you sign up for our affiliate program, you get instant access to our Affiliate Profit Headquarters… which gives you multiple products you can promote and all the resources, marketing tools, and information you need to be successful. You get access to cutting edge tools like article landing pages, video fake out banners, auto responder emails, video sales letters, brandable PDFs, articles, videos, audio, and MANY more affiliate tools and marketing resources. CriticalBench.com has been around for 10+ years and is a multiple six-figure business. It's grown into one of the largest and most respected muscle, fitness, and strength-building sites on the Internet. ven with all of our success, we feel that we're JUST getting started! Thankfully, being both an affiliate AND an information publisher over the last 10 years... I know exactly what it is you need in order to succeed quickly and easily. So that's exactly why I stocked my affiliate resource section with EVERYTHING you need. I truly feel it's the best fitness affiliate center in the world! Since we've spent 10 years knowing what works and what doesn't... simply get people to our site and your work is done. We have one-click up-sells so you can triple your commission per sale! 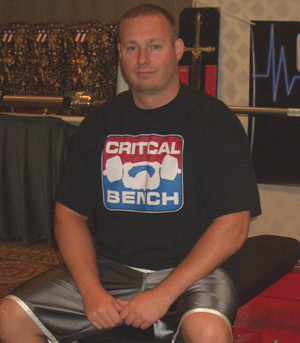 The Critical Bench Program 2.0 has a proven track record… having sold over 10K copies. You get a custom landing page with a professionally done sales letter. As soon as someone purchases a Critical Bench product through your link, you get paid a commission and the funds show in real time in your Clickbank account. You can log into your account any time to check how much money you've made. 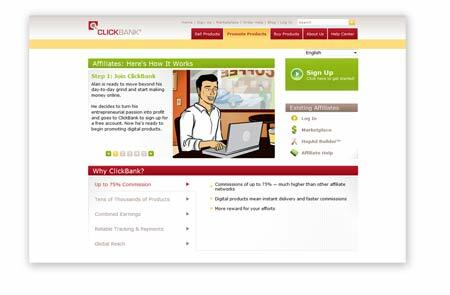 Clickbank has been online for a long, long time and they're one of the best in the biz. So without a doubt, you'll always get a check or direct deposit of your earnings on time every 2 weeks. Well, the amount of money you make is really up to you and how hard you decide to work and promote the products. You're in complete control of how much you make! With very little effort on your part at all (once everything is set up) you can easily take care of your car payment or even mortgage payment each month! Now, even though we can't guarantee how much you'll earn… we can tell you that MANY of our affiliates earn hundreds, thousands, and tens of thousands of dollars each and every month. So, there really is NO ceiling or limit on the amount of money you can make. Let's say you have an email list and you send out a promo for one of our products. You could easily make $1,000, $5,000, or even $10,000 with the click of the "send" button. Yes, this really does happen! Just take a look at one of our Clickbank accounts. 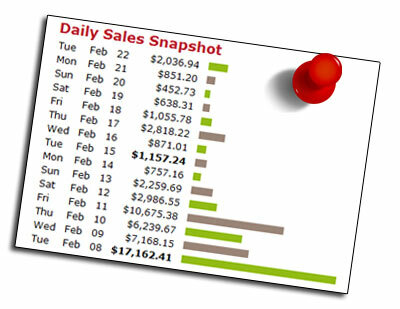 This is just one of the weekly sales snapshots. Anything we've done, you can do too! You can place our banners on a highly-trafficked website or you can use Pay Per Click Engines like Google Adwords to promote Critical Bench. You can use article marketing and put your affiliate link in the resource box or you can send out a promo to your email list. The truth is, thousands of affiliates have been earning a steady income over the past 10 years simply by promoting our high-quality Critical Bench products. 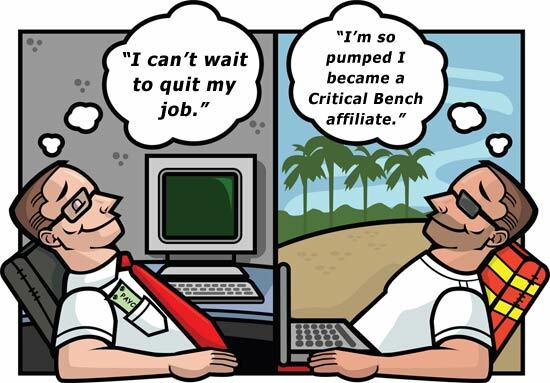 Becoming a Critical Bench affiliate is absolutely FREE. If you're a new affiliate and don't have a Clickbank account yet, go to Clickbank.com and sign up for a free account. Once you sign up, you get a custom "referral" link that you use to drive people to our site. If you have any trouble or questions at all about setting up your referral links, simply visit our Affiliate Resource area or just send us a quick email and we'll be glad to walk you through. If you're serious at all about staying up to date with the latest marketing tools, tips, promotions and products that our top affiliates use to generate incredibly high affiliate commissions… then I strongly urge you to sign up for our Super Affiliate newsletter. I personally spend over $30,000 a year on marketing education including Seminars and mastermind groups. I buy all the latest products to stay current and up to date. So I'll share all my proven tips and techniques you can use to promote Critical Bench products. Once you sign up for our affiliate program newsletter, you get instant access to our private affiliate resource area, which contains professionally-designed book cover graphics, banners, promotional letters, text ads and classified ads. In the Affiliate Resources area, you'll find all the marketing tools you need to start making money immediately. As you can see… if you're a serious marketer and think you have what it takes, the Critical Bench Affiliate Program is a great way for you to make a great income while helping others get in shape and enjoy life again. That's all there is too it! Now you can write your own pay check by promoting our high-converting and popular Critical Bench products! PS. If you're already a Clickbank affiliate: you can begin promoting Critical Bench products immediately using your existing Clickbank nickname. However, we still recommend you sign up for our Super Affiliate newsletter if you haven't done so, because it will give you instant access to our complete line of proven affiliate marketing tools you can use to promote the products and make this partnership the most successful it can be.